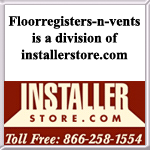 Order new white air vents and replace your old outdated floor registers. These floor register vents are sure to look great with your existing floors. Easily adjust your white air vents with a control lever that opens and closes the steel damper. Our floor register vents are offered in 11 common sizes. They are listed in the table below in inches. White air vent installation is simple, just drop the floor register vents into the openings and you are done! Because these floor register vents have a steel core, they are very durable and sure to last for years. Moreover, the steel faceplate of the white air vent is protected with a powder coated finish which will help to prevent rusting. Tip: Floor register vents are ordered for the hole size they work with. If you have a hole in the floor that measures 4" x 12" you will want to order a white air vent that is 4 x 12. Total size dimensions can be found listed in the table above. Find additional options for floor register vents in many finishes and styles. Order new white air vents and have those old ones swapped out in no time! Order today and have them shipped straight to your door.